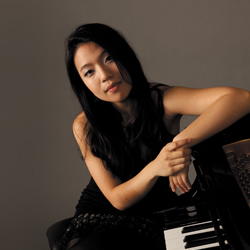 Pianist Joyce Yang came to international attention in 2005 when she won the Silver Medal at the 12th Van Cliburn International Piano Competition. The youngest contestant at 19 years old, she also took home the awards for Best Performance of Chamber Music and of a New Work. In 2010 she received an Avery Fisher Career Grant. Yang has performed with the New York Philharmonic, Philadelphia Orchestra, Los Angeles Philharmonic, BBC Philharmonic, and the Chicago, Houston, Pittsburgh, San Francisco, and Sydney symphony orchestras, among many others, working with such distinguished conductors as James Conlon, Edo de Waart, Lorin Maazel, Manfred Honeck, David Robertson, Leonard Slatkin, Bramwell Tovey, and Jaap van Zweden. She has appeared in recital at New York’s Lincoln Center and Metropolitan Museum, Washington’s Kennedy Center, Chicago’s Symphony Hall, and Zurich’s Tonhalle. 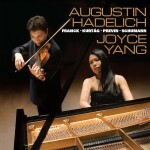 AVIE Records has released two Joyce Yang solo albums: Collage, featuring works by Scarlatti, Liebermann, Debussy, Currier, and Schumann; and Wild Dreams, with music by Bartók, Hindemith, Schumann, Rachmaninov, and transcriptions by Earl Wild. the Brahms and Schumann Piano Quintets with the Alexander String Quartet (Foghorn Classics), and Michael Torke’s Piano Concerto with the Albany Symphony (Albany Records). Born in Seoul, Korea, Yang moved to the United States in 1997 to study in the pre- college division of The Juilliard School, where she later graduated with special honors, including the school’s 2010 Arthur Rubinstein Prize. 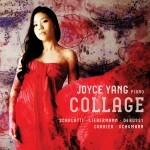 Joyce Yang is a Steinway artist.